This project explored the impact of the ideals of feminine beauty on the development of body image and identity amongst teenage girls. Although the inspiration and influences for the project were diverse, they were anchored by several common objectives which sought to increase self-esteem, promote emotional awareness and ultimately encourage a more accepting attitude to body image. I had the wonderful opportunity of working with three groups of teenage girls and their enthusiasm, poignant insights and eager discussions were indicative of the pervasive impact, immense pressure and harmful methods used to conform to current ideals of beauty. The project was inspired by the poem ‘Mirror’ by Sylvia Plath, wherein the mirror becomes an object of dread, a source of anguish and rejection of the self. The disparity between reality and perception are described as harrowing and the amount of time squandered is lamentable. The motif of mirrors as menacing is seen in Snow White and the Seven Dwarves as the Evil Queen resorts to murderous actions when her mirror tells her that her step-daughter is more beautiful than her. In Black Swan, the modern interpretation of Tchaikovsky’s Swan Lake, mirrors are used consistently and to a dizzying effect as the lead character struggles with her identity, professional pressures, weight and loss of control. In ‘My Brilliant Career’, by Miles Franklin the protagonist, Sybylla Melvyn is so convinced of her ugliness that her aunt enforces a regime whereby all the mirrors in the house are covered. Only when Sybylla has developed her self-esteem and is able to accept herself lovingly is she allowed to look in the mirror again and she is surprised at what she sees. Mirrors as such are represented as ominous and threatening objects, in their reflections women make vicious criticisms, harsh rejections and severe judgements. How often do we look in the mirror, how often do we notice what we say to ourselves, would we ever dream of being that cruel to another person? This is the premise of ‘You Can Heal Your Life’ by Louise Hay, a motivational writer and lecturer. Her philosophy is based on the principle that our thoughts influence our emotional and mental well-being. Her practice uses positive affirmations, often said into a mirror, to retrain thinking from negative patterns to positive ones. Would it be possible change the mirror from a place of criticism and despair to a space for affirmation and acceptance? In the mirror of my parent’s house there appeared a note when I was a teenager. It read, ‘You are now looking at the person who is responsible for your own happiness’. Every day before I left the house I looked in the mirror and rarely saw the note, but sometimes I did. It made a difference. In Mexico they commemorate those who have passed away during the Dia de los Muertes ceremonies. Beautiful shrines are made, decorated with photographs, cherished trinkets, favourite foods, flickering candles and strewn with bright marigold flowers. The vibrant colours and cheerful reminders of each person’s character imbue the ceremonies with a joyfulness as well as a respectful recognition for those who have passed. Perhaps this aesthetic and approach could be applied to mirrors? The content, resources and methodologies were diverse and the purpose of this was to engage each person on some level, whether it be through poetry, discussion, keeping a diary, artistic expression or writing a diary. The themes and concepts were introduced through reading Mirror by Sylvia Plath which led to discussions of body image and the gap that may occur between the ‘real’ and the ‘ideal’. In order to develop awareness of the internal voice each person kept a private diary of what they said to themselves in the mirror for a week. On reflection of the diaries it was possible to identify the difference between positive and negative observations which led to discussing if their internal voice was a critical one or an accepting one. 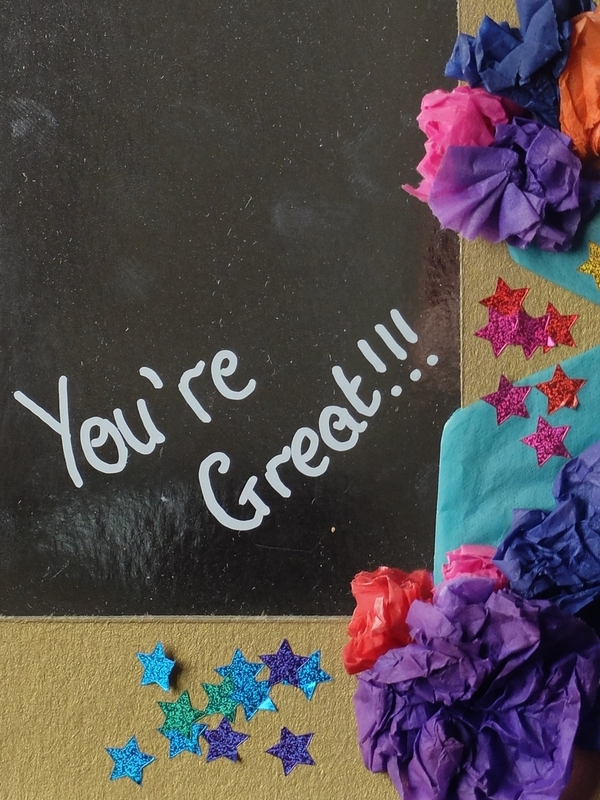 After reading through some examples of affirmations, each person wrote their own which was kept in their homework diary and practiced in the mirror for the following week so as to understand the influence and effect of positive self-talk. The diaries were continued in order to encourage a technique that can enhance emotional awareness. On reflection and discussion of practicing the affirmations in the mirror, the majority found it strange and uncomfortable at first. 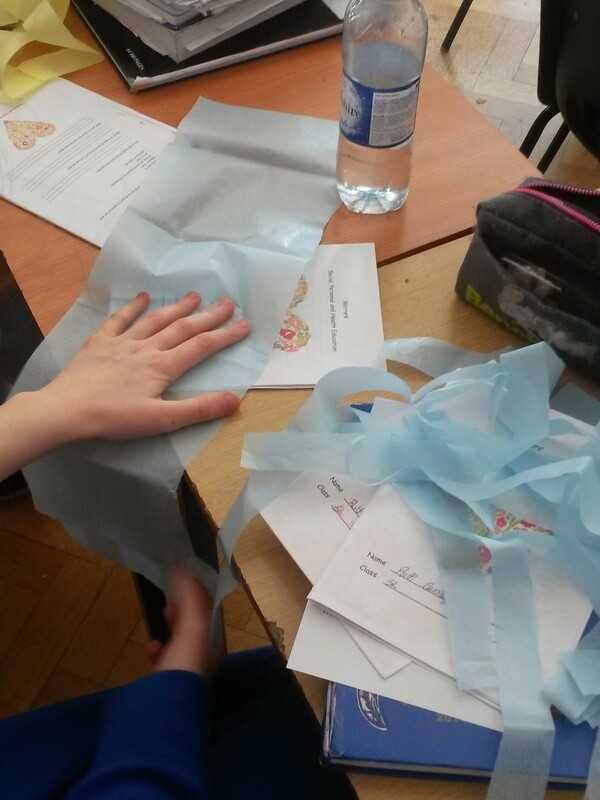 During the final stage of the project each person was given a small paper mirror and cardboard frame to be decorated with tissue-paper, glitter, sparkles, gems and anything else they could think of! 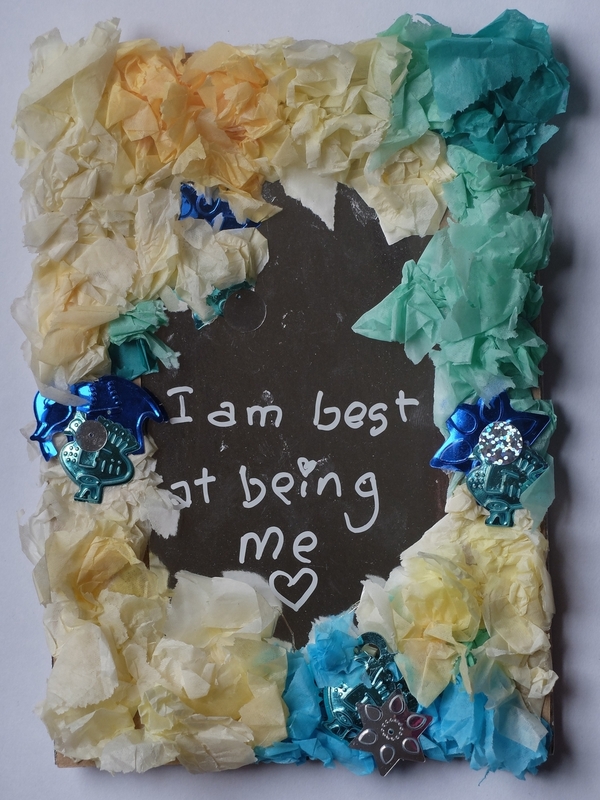 Their individual affirmations were written across the mirrors to act as a constant reminder of how to adopt a positive and accepting attitude to body image and identity.